Nick & Wendy Harden are A Unicycle Built for Two. They bring together the unicycle, acrobatics, and light-hearted romance. 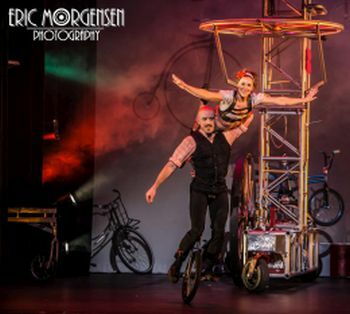 The Seattle Met called their act a “can’t-miss.” Time Out New York named them as a “standout” of Cirque Mechanics’ internationally touring show, Pedal Punk. Nick & Wendy met and married in Seattle, and together they have crafted their unique story on the unicycle. They have performed with companies including Cirque Mechanics, Flynn Creek Circus, Zoppé Family Circus, and they are excited to return to the Moisture Festival this year.